Flight from Europe to Chinggis Khan Airport in Ulaanbaatar. Morning arrival at Chinggis Khan Airport in Ulaanbaatar, transfer to the hotel, short break after the breakfast, city tour including the Gandan Monastery and the National Museum. Visit to the Choijin Lama Temple Museum after lunch and have dinner at the hotel. In the morning, we start our drive to the south to visit the mountain Baga Gazriin Chuluu, an interesting rock formation in the middle of Gobi desert. Late in the evening, hike to the mountains (approx. 10 km) and stay the night at ger camp. In the morning, hike the ruins of the temple located in small ravine (approx. 15 km) and continue our trip to the Ongi River with ruins of monastery. In the evening, we take walk to the monastery, which was completely destroyed by the communist purges during 1930s. Stay the night at the ger camp. In the morning the driver brings us to the Bayanzag, where the most famous fossil of dinosaur in the world exists. In the afternoon, hike to the “Flaming Cliffs” (approx. 20 km). Stay overnight in ger camp. Day 6: Vulture Canyon "Yoliin Am"
Drive to the Vulture Valley of "Yoliin Am", which is covered with an ice layer in the summer. 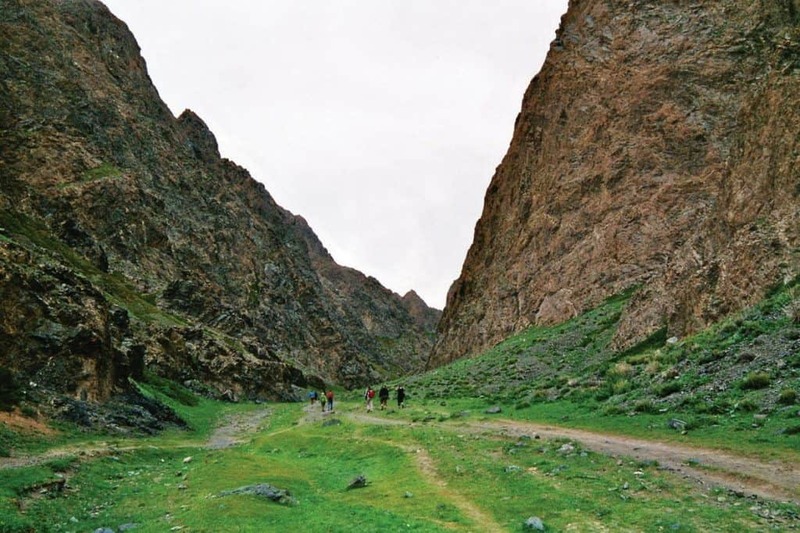 In the afternoon, hike in the national park "Three Beauties of Gobi" (approx. 15 km), visit the Gobi-Museum and stay the night in ger camp. Travel through the beautiful Gobi desert goes on to the sand dunes of Khongoriin Els. In the afternoon, hike to the dunes (approx. 15 km) and stay the night in ger camp. It is possible to visit camel breeding family and ride the camel during your free time. In the morning, drive northward and hike over Altan Amin Davaa (approx. 10 km). In the afternoon, drive to our ger camp at village Guchin Us. We will carry on our trip by heading northward to hiking over mountain Avzaga Khairkhan (approx. 15 km), we will reach provincial town Arvaikheer late in the afternoon and will stay at a hotel. 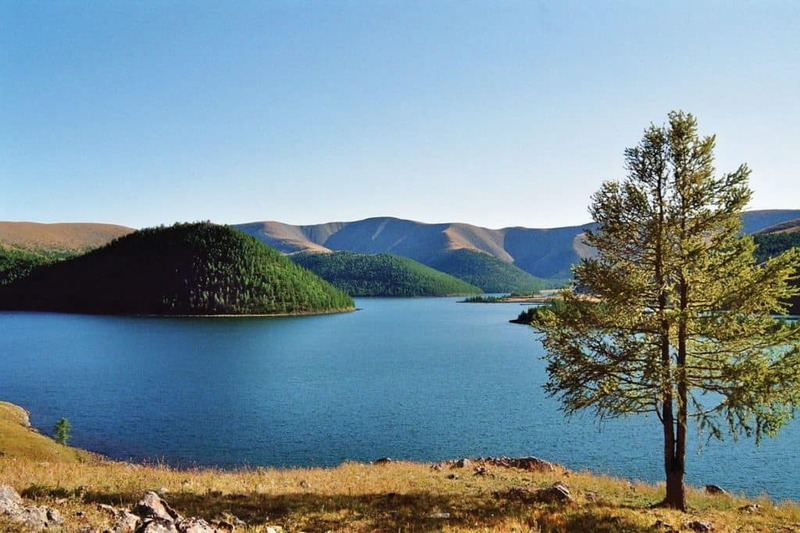 Today we will drive through Uyanga village to visit the beautiful lakes of Naiman Nuur, located in the Khangai Mountain. In the afternoon, we will explore the landscapes around the lakes on foot, stay overnight in tents next to campfire. In the morning, we will start our hiking trip around the lakes (approx. 20 km). Have dinner and stay the night at campsite. 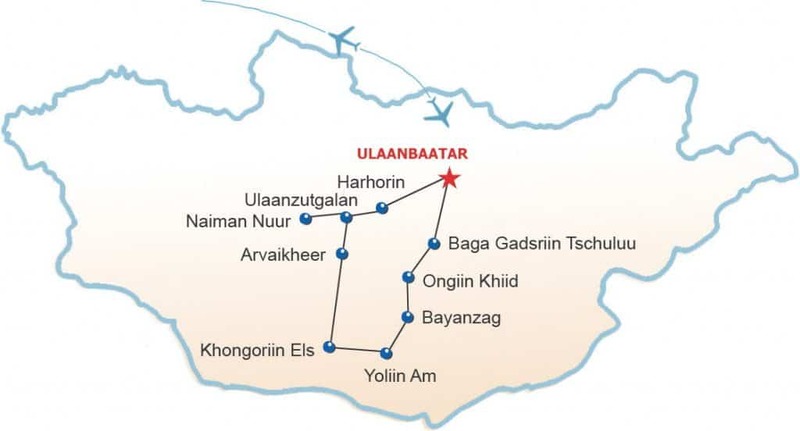 In the morning, on the way of heading for the waterfall Ulaanzutgalan, we will hike over Uvtiin Davaa (approx. 10 km) and then have a short break in the Bat-Ulzii village. Afterwards, drive to waterfall. Stay the night in ger camp managed by local nomads. Hiking day (approx. 20 km).Visit the yak breeding nomads. Stay the night in same ger camp. In the morning, drive to the temple on the peak of Tuvkhun Mountain and hike (approx. 15 km). Go on pilgrimage to the temple (World Heritage Site), stay the night at ger camp next to hot springs Jaran Raschaan. Kharkhorin, visit the Erdene Zuu (World’s Cultural Heritage), which is a magnificent monastery and built on ruins of early capital city by Chinggis Khan (visiting for more than 3 hours). In the evening, talk folklore and stay the night in the ger camp on the shores of the Orkhon River. Early in the morning, drive back to Ulaanbaatar. In the afternoon, we will reach our hotel in the city. In the evening, have dinner and traditional folklore. I agree that my entered information is stored by Explore Mongolia. Explore Mongolia is operating it’s travel business since 1999. Ecological responsibility is our pride and trade mark. We offer trips to the most beautiful natural wonders of Mongolia. We support conservation projects by the Mongolian Eco-Tourism Society. The wild an untouched nature of Mongolia offers many possibilities to watch and relax! © Copyright 2019 Explore Mongolia. Travel Agency by Rara Theme. Powered by WordPress .